Great for families and friends! Malacca Hari Raya Special: Only $139 per pax for 2D1N stay at 4-Star The Settlement Hotel (Deluxe Room) + Return Coach Transfer. Min 2 to go. 1 voucher is valid for 1 pax. Minimum 2 to go. Rates are based on double occupancy. Malacca is the historical state of Malaysia, rich with heritage buildings, ancient landmarks and colonial structures. It was here that colonial forces first made contact with Malaysia, which eventually shaped the country into its current economic and political system. Today, you can still see the imprints of British, Dutch and Portuguese forces left behind in forts, museums, churches and towers. 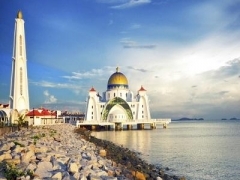 Visit Malacca for the cultural experience of a lifetime! The Settlement Hotel is a gorgeous four-storey boutique hotel born from a two-year restoration of one of Malacca’s former government buildings. This lavish abode is also home to 3 therapy and massage rooms, a spa and even as outdoor swimming pool where guests can rest up in between holiday adventures. Stay connected with the rest of Malacca via a convenient shuttle service to popular local attractions such as Jonker Street.